The latest Set Video from 'THE DARK KNIGHT RISES' features Tumblers firing in the streets! We have some new video & images direct from the sets of Christopher Nolan's Dark Knight Rises that features Tumblers rocketing down the streets & firing mortars on streets of Pittsburgh. The final chapter in the current trilogy stars Christian Bale, Anne Hathaway, Tom Hardy, Joseph Gordon-Levitt, Morgan Freeman, Gary Oldman, Marion Cottilard & Michael Caine. Hit the jump to check it out. Images & video come courtesy of Subaruwrxfan & PittsburghMovies on the sets in Pittsburgh. 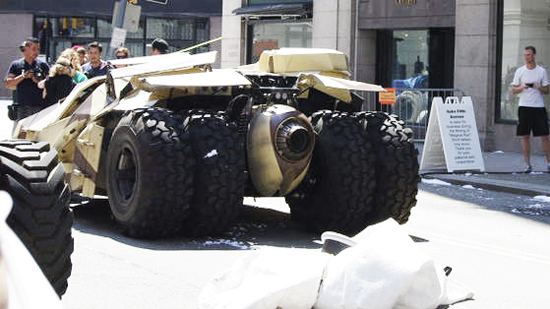 I'm reading: The latest Set Video from 'THE DARK KNIGHT RISES' features Tumblers firing in the streets!Tweet this!